Having just moved into a new house, I feel as though my options for entertaining are endless. All the spaces, corners and dining areas are yet to be used so when I sat down to work out where I was going to have a relaxed Christmas lunch, I knew the outdoors was the perfect spot. Christmas in Australia is often an outdoor affair with the sun shining and delicious seafood on display, and seeing as I am home this year - I am going to make the most of it. I wanted to have some fun this year and even though the colour scheme is less colorful than years gone by, I felt it was a really beautiful and relaxing look. The wreath is the centerpiece of my decorating this festive season; from doors to walls to motifs on my gifts, to food we will be feasting on and the table we will be sitting at. So it makes total sense that I start in the center and work out! I created my wreath by using a collection of fir branches in vases and placing them in a circle, while small wreaths with a lush green ribbon sat neatly on the placemat bringing a little more color to what is a simple setting. Silver trays hold a textural white plate with a grey and white printed napkin; a faux reindeer horn from Adairs adds a little Christmas cheer to the look as does the small gift which also acts as a place setting. Making your own mini wreaths is so easy to do - you just need a nice long fir stem and tie together with a ribbon or twine. It’s ok if they are not perfect as that’s the charm. And who can forget the traditional bon bon? Mine are from Provincial Living and match perfectly with my wrapping. With a little fir wreath, that I made myself, and ribbon attached it fits seamlessly in and adds a little frivolity to what is a classic white look. Last but not least...I can’t help give a gift on the table - it can be as simple as a box of sweets, to a beautiful personalised gift. Need to cool down this Christmas? This simple DIY is perfect for pre-Christmas drinks, all you need is a bottle of vodka and a wine chiller and you are good to get started! 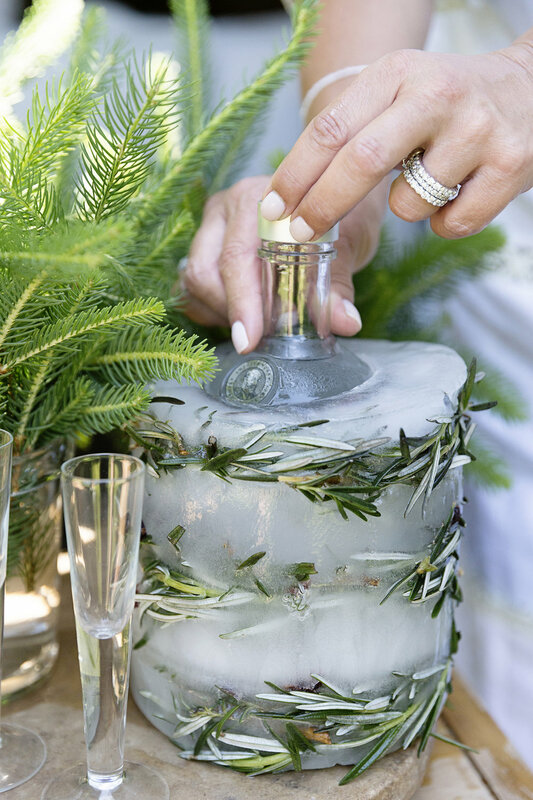 Put vodka bottle (vodka doesn’t freeze!) in a wine cooler (or cylinder of some sort )that can be placed in the freezer. Fill water 1/4 way then place one wreath and a few cranberries in the water and freeze. Once frozen, repeat for wreath two & three. You will now have three frozen layers, time to finish it up! For the top layer (which is 1/4 that will sit below the base of the next of the bottle, fill with plain water (no wreath or berries) to seal it in. Remove it by defrosting enough to slip out, or put boiling water on outside of chiller for easy removal.